Students and alumni do not need to pre-register online. Please contact your college/university’s Career Services Office for information on attendance. 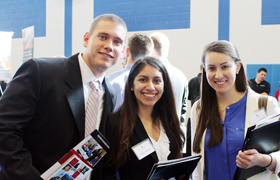 There are other educational consortia in North Carolina that offer early career fairs. Contact your university career services office to arrange permission to attend one of these fairs. Students from the Eastern North Carolina Career Alliance are invited to participate in our career fair. Contact your university career services office to make arrangements to attend.